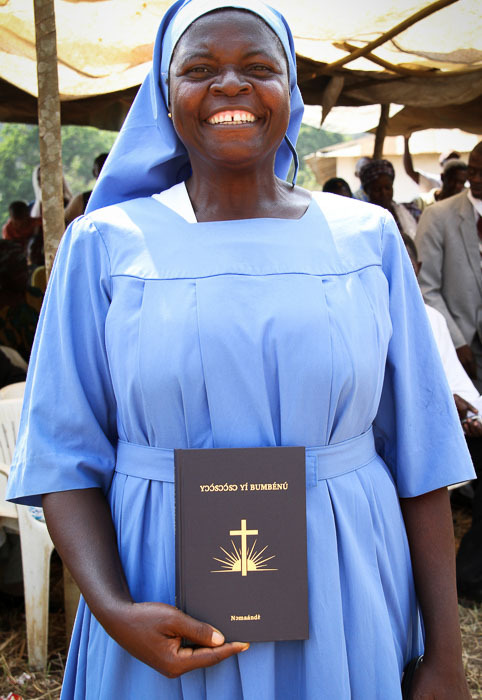 A woman’s beaming smile reflects her uncontainable joy at the 2009 celebration of the completion of the Nomaande New Testament. Celebrations like this represent significant milestones for many minority language communities. Frequently, the translated New Testament is the first printed book in the language. This is a milestone, but not the end of the road. Of the 6000 Nomaande speakers in Cameroon, only five percent are literate in their mother tongue, but 40% of the population are literate in French. Now with a substantial book to dive into, Nomaande readers will enjoy reading their own language. But nonetheless, a huge challenge remains for Nomaande church leaders who desire their people to use and apply the Scriptures. In 2011 Faith Comes by Hearing produced audio Scriptures in Nomaande so that Scripture is accessible even to those who haven’t yet learned to read in any language. Scripture engagement projects like this, as well as literacy classes and work in Old Testament translation continue in many language communities long after the celebration of the New Testament is over. Often done with little fanfare and sometimes without adequate funding, these programs remain vitally important.